It was a long weekend in Melbourne this past weekend. My poor boyfriend had to work two out of the three days, but I just received my most recent Spoonflower order so I bunkered down for a weekend of sewing. 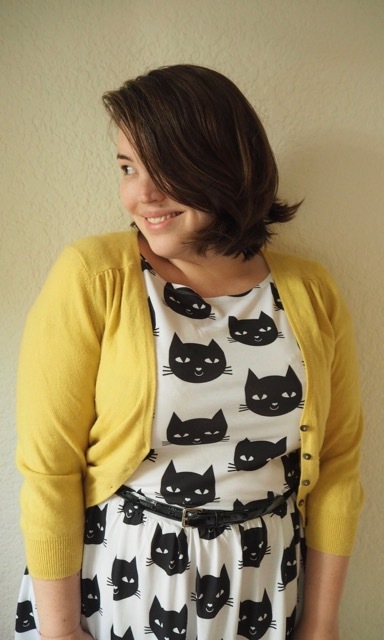 Spoonflower recently had a sale on their ‘modern jersey’, the same cottony knit that I made my frockatoo dress out of. 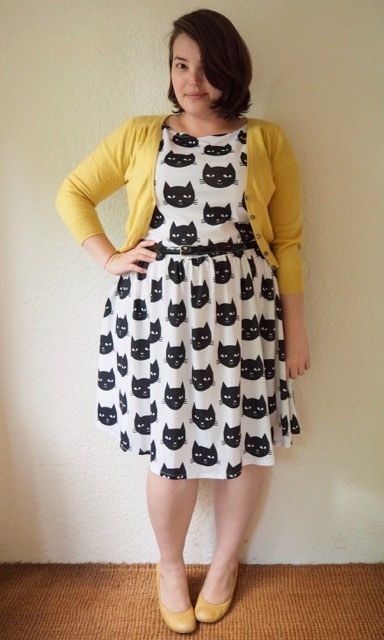 It wears and washes well, so I thought I’d buy some more yards and tun out another Moneta dress using my old pattern. 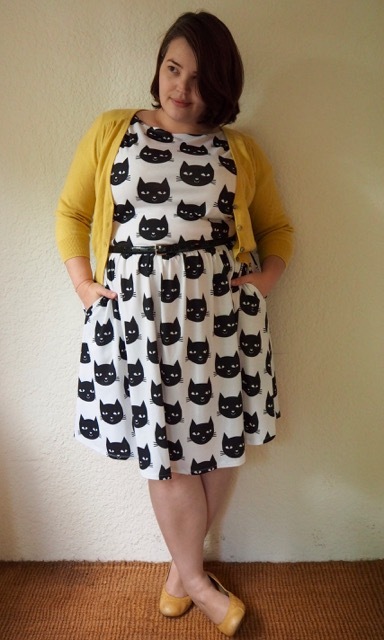 I quite fancied the idea of another Crazy Cat Lady dress, so snapped up this graphic cat face printed fabric, designed by Charlotte Winter. 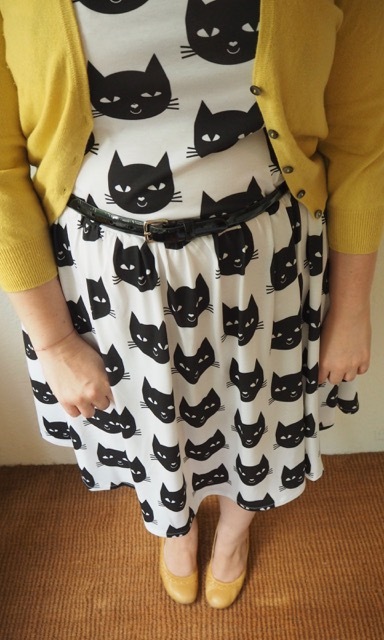 I thought the bold black and white print would carry me well into the cooler months when I could wear it with black tights and any number of bright coloured cardigans. It does look particularly nice with yellow though! I included the deep pockets, even though they add bit of volume on the hips. Sometimes I choose to skip them – especially if I’m using a heavy fabric like a ponte – but they’re so useful that I put them in when I can, and the modern jersey is soft and drapey enough that pockets don’t change the silhouette too dramatically. I’m pretty delighted with the result, and I’m looking forward to putting it into regular rotation in my wardrobe! 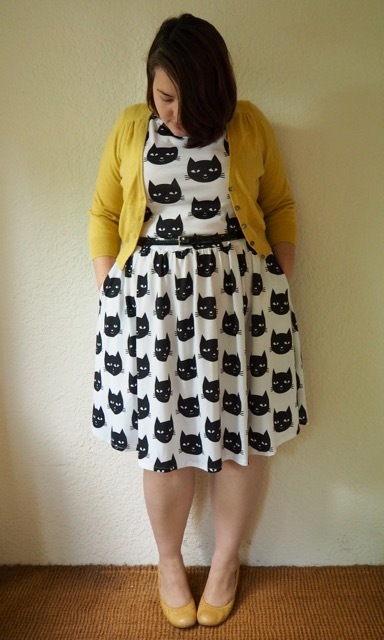 This entry was posted in DIY and tagged boden, cardigan, colette, cool, DIY, dress, seychelles by lillipilli. Bookmark the permalink. I don’t suppose you’d be interested in becoming the owner of the Colette Crepe dress pattern, one careful previous owner? It and I are not getting along very well as I’m a total beginner so I’m looking for a new home for it. You look adorable! I would so totally dress like this if I weren’t 68! You are a great body image for young women–you prove that you can be totally cute and not be anorexic! You might try stitching a row of thin elastic (1/4″) to the waist seam to help with the stretching out. It can be done while you’re sewing the dress, or after. Stretch it only the tiniest bit to give some stability to the seam without gathering the bodice. LOVE, LOVE, LOVE this dress and you look fabulous in it! I adore that cardigan , too. I’d like to point out that you single-handedly made fall in love with a yellow/mustard cardigan and I just received some lovely fabric to sew one up! You look adorable in this dress. I want one! This is darling! Looks great on you! 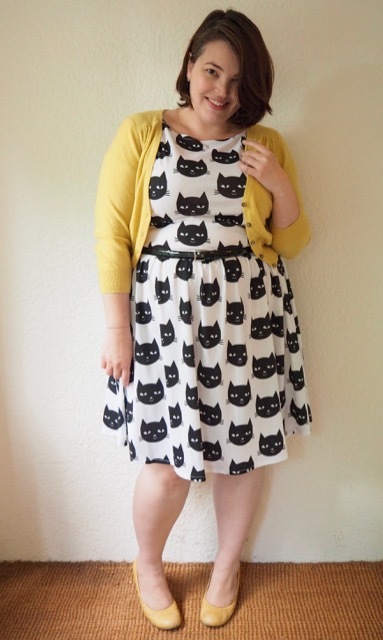 Love the print with the yellow – great dress – you look fantastic! That’s so cute! Been thinking about making my own dresses. Think Moneta would be good for a beginner? Anything with a knit fabric is good for beginners because the stretch eliminates a lot of the fitting issues. The Moneta does have set in sleeves, which might be a bit tricky for a total beginner, but I find that Colette’s instructions are really clear and straightforward – give it a go! Because of you, I own a yellow cardigan. It makes me so happy. Thank you for the inspiration!